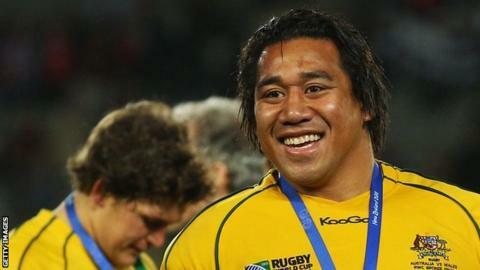 Cardiff Blues have signed former Australia prop Salesi Ma'afu following his release by French club Toulon. Ma'afu, 32, left the European champions by mutual agreement after being found guilty of assault and given a suspended four-month prison sentence last month. In a statement, Blues said Ma'afu had joined "with immediate effect - subject to the normal visa process". "We are thrilled to sign Salesi and welcome him to Cardiff Blues," said head coach Danny Wilson. "He is a powerful prop forward. He has a fantastic pedigree in the game." Ex-Northampton Saints forward Ma'afu, brother of former Cardiff Blues player Campese, switched codes from rugby league to union as a youngster. He made his senior international debut for Australia against Fiji in 2007 and went on to earn 14 caps and played at the 2011 Rugby World Cup. Sydney-born Ma'afu joined Northampton in 2013 and helped the club win the English Premiership title and the European Challenge Cup in 2014. But he missed the Challenge Cup final after getting a one-week ban for punching Leicester's Tom Youngs. In February this year Ma'afu was also banned for two weeks after striking London Irish's Tom Court, before signing for Toulon in June. The Blues currently lie 10th in the Pro12 with 14 points from their first nine games, and second in Challenge Cup Pool 3 after Thursday's 23-22 loss in Montpellier.